Toys and presents litter the floor as I write this and think about the speed with which the holidays have hit us full on. It was only four weeks ago during Thanksgiving, a rare day when both firearms deer season and turkey season occurs on the same day in Virginia. I had, for the second straight year, been able to make it down for the earlier two-week fall season for birds in the state and was looking for a chance at a little double-duty on this chilly morning. My buddy's son, Chase, had told me of some birds he heard right at roost time from where he was hunting the evening before so I headed to the area, knowing it to be a good spot for both deer and turkeys. As I hunt in a shotgun-only county, I had the chamber and mag loaded with buckshot, and a pair of No. 5s tucked in my shirt pocket for quick access. I had forgotten my calls, but dug around long enough in my truck to find a partially dry-rotted mouth call. After sucking on it for about 15 minutes, I was able to pull a passable yelp from it, but little else. At first light, I heard roosted birds begin to call at least a couple hundred yards through the woods and did my best to make them hear my calls. From there, the woods fell silent except for the occassional yelp I would toss out about every 20 minutes or so. Around seven, I hit the call again, but instead of the usual silence heard a yelp answer me from what I thought was less than a 100 yards behind me. I slipped a turkey load from my pocket, slid back the bolt on my near-ancient Remington 1100, and promptly dropped the 3-inch 000 onto the metal platform of my climber. I just winced and slipped the No. 5 in its place, hoping for a miracle. I got one. As I turned to look and call once more, I heard an alarm putt. My eyes searched frantically for the source and found it, in the form of three hens, 40 yards out and angling off to my left, not directly behind me as I had first thought. One of them stepped behind a large oak giving me the chance to raise the shotgun. When it stepped clear, I fired. It was the first fall bird I had taken in three years, ending the longest autumn drought I've ever had since beginning chasing fall birds more than a dozen years ago. I clambered down the tree, collected my prize and scrambled back up in the climber to finish out the morning. A half hour later, a small doe eased by and I added her to the morning's chores. The annual Thanksgiving dinner at Howwin Farm would have it's blackened deer loin for appetizers and a real holiday turkey for a meal, even if I didn't get the chance to sample it myself. I would give it to my brothers and friends to enjoy as I hustled off to join up with the wife and kids. The gifts yesterday where of a different kind, but no less wonderful, as I watched my daughter delight at her gifts and shared time with family and friends that I seldom get to see. I hope your holidays have been just as wonderful and given you plenty of time to reflect on all the things for which you can be thankful. And as we head into this New Year, I hope each of you find a little more time to do the things you really want to do and achieve. I know I'm going to get started tomorrow, when I head out to the woods for another morning of hunting on my Virginia farm, the first time I will have had a chance to go back there and hunt since that awesome Thanksgiving hunt. Eleven-year-old Amanda Matthews of Woodland Park, Colo., has been helping call in turkeys and elk with her dad, Randy, since the age of 4. 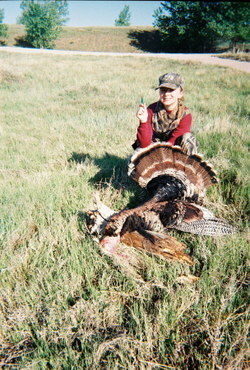 In that time, the two have shared many successful hunts, including the one pictured here where Amanda finally got to pull the trigger herself. She used her father's old single-shot .410 to drop this Flagler, Colo., trophy, her first given her age. The longbeard weighed in at 22 pounds and had a 9 1/2-inch beard and 1 1/2-inch spurs. Pretty darn phenomenal for a Merriam's and an incredible first bird. Randy, who sent the photos in, says he's looking forward to hunting with Amanda for deer this fall. Good luck to both of you and good luck in the photo contest. Turkey hunting has really taken off in a place where people once though impossible, but the province of Ontario in Canada has become a true turkey haven. In fact, I got a chance to see firsthand, how into turkey hunting sportsmen are up there as I joined some on a trap-and-transfer project one December. It was the coldest few days of my life, but I met some of the best people you could ever want to meet during the trip. Jeff Vandrish of Williamstown, Ont., sends us our first entry from Canada. Thanks, Jeff. Here's a shot he took of a trophy gobbler he tagged this year. It weighed 21 pounds, 9 ounces and had a beard that measured 9 3/4 inches. Great pic and nice bird, Jeff. You're entered into the Give Us The Bird Photo Contest. Winners will be announced Friday! Gabe VanWormer of Bancroft, Mich., sends us this photo of a very proud Haley Jennings on her 10th birthday with her first every turkey. 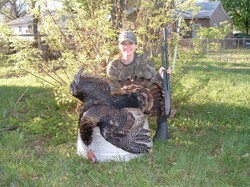 Haley shot the bird, a 16-pound jake with a 4 1/2-inch beard, at 20 yards away with a 20-gauge shotgun. 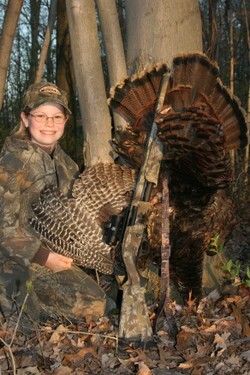 Her dad, Bill Jennings, called the young tom in as Gabe filmed the hunt. Says Gabe: "The real trophy is a hunt that father and daughter shared together and will always be a memory they'll have together." 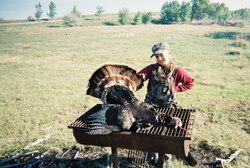 In fact, just after midnight as Haley's birthday arrived, her father purchased her license on-line and the group hit the woods the next day, upon which Haley tagged the bird you see here. What a birthday present!!! Congrats to the Jennings family and thanks to Gabe VanWormer for sending this picture in and sharing Haley's story. For that, Gabe will be entered into the Strut Zone's Give Us The Bird Photo Contest. By the way, Strut Zoner Connie Miller asked me a very good question the other day and that is, "When am I going to announce the winners?" My apologies to those of you who have been waiting for the announcement. I had pushed it back a little along with the deadline for entries in order to run as many of the pics received before the announcement. I also forgot that I had planned this in the middle of magazine deadline here at OL. Well, the deadline for that is over and I hope to get the pics voted on this week and will announce the winners THIS FRIDAY!!! You can plan that one like opening day. Thanks for everyone's patience. Friday, April 13th was a lucky day for me. I was hunting close to Melvern, Kan., with my buddy Jason, who lives in the area. The day before we'd had two very close encounters while bowhunting, but could not get a shot. With the end of my trip drawing near, I decided to switch to my 12 gauge. Friday morning we decided to try an area along the river where we had seen turkeys all week. The problem was, the river was up too high to cross and a lot of the turkeys, after roosting on our side, flew across the river. That meant we had to get to them as soon as they flew down. We got out early and soon heard several gobblers several hundred yards away, along the edge of the field on our side of the river .The river ran right along the edge of the field ,and the steep banks were perfect for sneaking along out of sight of the turkeys that had ,by this time, flown down and were feeding in the field. We eased up the bank everv now and then to check on the turkeys, and once we even flushed several hens still on the roost. They flew across the river which put them out of our way, and thankfully didn't spook the birds we were trying to catch up with. The turkeys started feeding across the field ,and when we finally got set up lying on the bank behind a log, they were straight across the field—about 150 yards away. Most of them disappeared in the woods except for one gobbler that stayed in sight. We decided to try to call him in. The weather had been rainy and windy and none of the birds had been responding well to calls, but with no other options, we gave it a shot. At first he seemed to hear us but didn't gobble or come closer until three jakes started heading our way. Then, he started coming and the birds met up about 70 yards out. We called every now and then and they fed their way toward us, in no hurry at all ,and kept looking for the "hen" they were hearing. Suddenly Jason whisperd that there were some turkeys coming from the right, but since we were 20 feet from the field we couldn’t get a clear look at them. By now the ones in front of us were within 35 yards but the gobbler was to my left and I couldn’t get a good shot. The jakes were in the open, but I decided to wait and, after what seemed a long time, the longbeard finally started toward an opening. I whispered to Jason when I had a clear shot and he clucked at the turkey. When the tom raised his head, I let him have it,,and he dropped right there. It started raining a few minutes after I shot him ,but I hardly noticed. 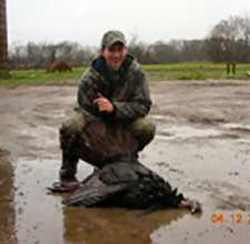 The gobbler weighed 23 pounds, and had an exteremely thick 8 7/8-inch beard and 7/8-inch spurs. He made an awesome ending for a great week! Nelson's entered into the Give Us The Bird Photo Contest, the winners of which will be announced later during the week. Stay tuned!!! We still have more entrants to run. Show and Tell, I can't help myself on this one. Sunday morning May 20, 2007, I was waking to an alarm at 4 a.m. on a farm east of Andrew, Iowa. Get the camo on, brush the teeth, pull the hair back, put the boots on out on the porch, put the turkey vest on, check the pockets (extra turkey load, turkey calls, chalk for my favorite box call, brown napkins so you’re not waving a white flag in those needed moments, water, decoy, hand warmer, clippers for the lovely multiflora rose, make-shift first aid kit, and all the other stuff you may have collected from past hunts that you had yourself convinced that you can't live without). Load the gun, put the vest on, hook the seat cushion to the vest, sling the gun over the shoulder, push the truck door shut as softly as you can and then you hear the first gobble of the morning. There is a peace over the open land and woods with the stars shining bright. We're heading to the West field with the glow of a night light, slightly shimmering to the east, soon to be the fiery ball of sun shining brightly in about 45 minutes. I head down toward the pond and find myself a nice little tree by the fence, as Jim goes up to his favorite corner. He can see the planted field to the east and north of him, alfalfa field to his south and a rolling pasture to his west, where it meets the big old hardwood trees that are nourished by a spring fed creek stocked with trout. The decoys are all positioned and we both are as cozy as can be, sitting on that old tired tail bone that has been abused for the last four weeks. I could hear Jim start that soft morning yelp of his call and I followed in. OH MY! GOBBLES from every direction and hens starting to pitch a fit. How dare there be a new girlfriend in town calling to my man! As the morning goes by, the calls get louder and the toms are cutting you off with their deep throated gobbles. There is something about the sound they make that can get anyone’s attention. Well, the morning goes by and still no sign of any turkeys around me, except a mouthy old hen over in the pasture and some toms answering my calls at a distance. The gobbles are sounding farther away now. My sleep deficit started to creep in along with the realization of it being Sunday with a full work week ahead of me. It's time to head home and call it quits to a long spring turkey season. Moving slowly, I pack my stuff up and head to the house with my eyes on the newly planted field so as not to step on the corn seedlings. There was no skip in my walk, the vest and the gun became a few pounds heavier. Jim met me at the truck trying to convince me that no one could say I didn't work hard this season in trying to get a turkey. That's why it's called hunting, baby. 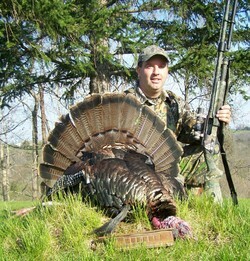 The man in the photo is Keith Gilbertson, who took this longbeard in Jefferson County, Wis., near Sullivan. 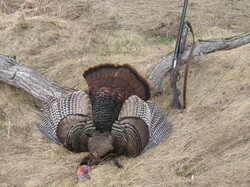 He was using a Winchester Super X3 shotgun loaded with none other than Winchester turkey loads. The tale of the tape: 22 1/2 pounds, 10 1/2-inch beard, 1-inch spurs. Pat Strawser, a custom call maker out of Millersburg, Pa., gets a lot of opportunities to share his turkey hunting knowledge with other hunters. And while Pat has enjoyed the chance to hunt with countless others and enjoys pulling the trigger himself, he says there is no greater experience in the woods than to experience a hunt through the eyes of a child still learning the tradition. Fortunately, Pat got the chance to help a number of kids take longbeards this spring, including this big Osceola taken by McKenzie Mull of Wichita, Kan. 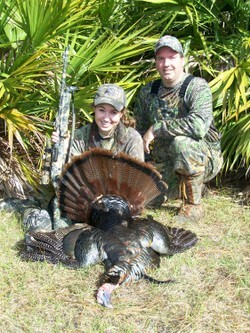 This was the 14-year-old girl's first Florida bird. It boasted a 10-inch beard and 1 3/8-inch spurs. McKenzie shot the tom using a 20-gauge Benelli, a good choice for a young shooter as it offers minimal recoil while using loads that provide more than ample punch. 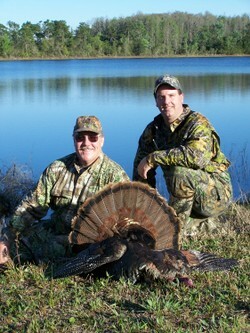 Hunting in Florida this year, Pat also got the chance to share a few hunts with adult friends including a successful day afield with Wayne Vickers of Ohio. The two scored on this nice Osceola during a March hunt. And finally in what is perhaps the best framed pic of the group, Pat shows off a bird he killed back at home in Pennsylvania. Look closely at the call and if you know anything about custom turkey calls, you'll note that the box in front of him is not his own work, but that of the late, great Neil Cost. 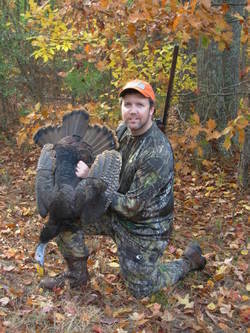 "This was one of the first turkeys I ever killed with one of ol' Neil's boxes," Pat writes. Not unusual since the value of some of Neil's calls since his death have kept them more on shelves where they are safe than out in the woods. During his life, Cost always believed in making calls that were functional first, then attractive, but with some going as high as $11,000 and up since he passed away, yeah, I'd be hesitant to take mine afield. Not Pat, he used this gem to call in this Pennsylvania bruiser that tipped the scales at 21 pounds and sported a 10 7/8-inch beard and 1 1/4-inch spurs. Congrats on a great season Pat and for most of all, introducing the sport to others. As the last post featured Kansas' Adam Kahrl and a gobbler he took this season, we felt it only right to run his wife's first trophy immediately after. After years of watching her husband head out each spring to chase turkeys, Kelli joined a growing list of female hunters and finally decided to give it a try herself. She earned her hunter safety license, practiced shooting before season, discussed it with her husband and watched some turkey hunting videos just to get a rough feel for how things might play out. She was ready. But her first hunts, like for many hunters, were tough. 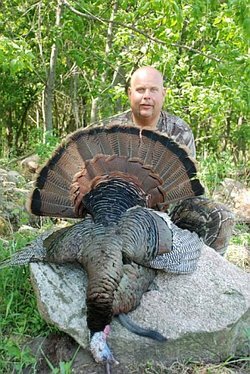 On one day with 35-plus mile per hour winds (not uncommon in Kansas), she and husband Adam actually had a tom approaching when her had blew off and spooked the bird. But she never gave up. 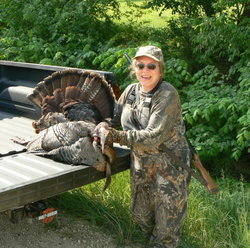 On another day, the woman hunter and her husband were setting up beneath a lone tree in a pasture where turkeys had been coming. As the two cleared a spot to sit, a limb broke causing several birds to gobble from the treeline about 100 yards away. Excited, the two set up, and with some calls, one of the longbeards flew down and strutted right over to within 30 yards of Kelli, who promptly tagged her first turkey ever. Congratulations Kelli. We hope this is the first of many. And thanks for sending the pics of you, your bird and your family. Like her husband, Adam, Kelli will be entered into the photo contest for a chance to win one of several prize packs. The deadline for entry submissions was July 4. 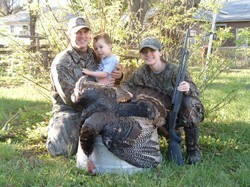 Our weekend of hunter photos continues as we showcase more Give Us The Bird Photo Contest entrants. 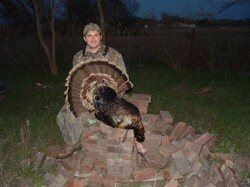 Here, Adam Kahrl poses with the tom he took in El Dorado, Kan., this spring. Kahrl was set up against an oak tree on a cow pasture with decoys in front of him when he spotted a few "black balls moving about 300 yards to the west in the field." Still aways out, the turkeys were clearly moving toward the hunter's calls. Continuing their approach, the birds drifted into the timber and going out of Kahrl's sight. "I kept softly calling to them and watching for movement," the hunter says. "In the blink of an eye, one of the gobblers made a mad dash for the decoys from the woods." As the bird charged into range, Kahrl hit it with a quick double cluck, which paused the tom long enough for the hunter to squeeze his trigger.